Perhaps you sit at a desk all day and get up feeling stiff and achy. Maybe you suffer from frequent headaches from staring at your computer. You may find that you’re now less able to do the things you love such as being able to play with your children or grandchildren without pain. 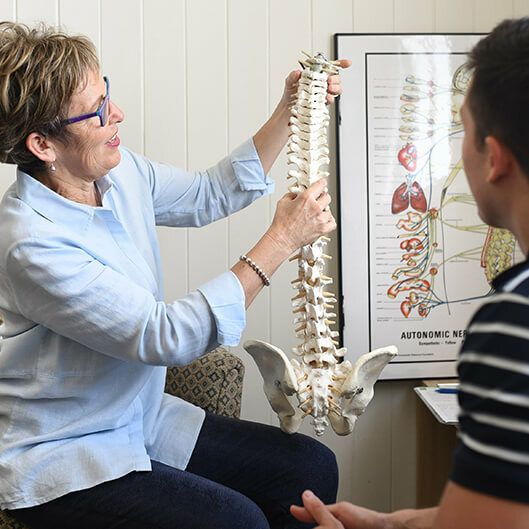 Newstead Chiropractor Dr Irene O’Brien has been in practice for over 25 years, she will listen to you as an individual and meet you where you’re at. Newstead Chiropractic is conveniently located 200 metres from the Gasworks Shopping Centre, and you can park for free in our on-site car park. Learn more about the techniques used in our practice, including SOT (Sacro-occiptal Technique). You should be able to live without discomfort and participate in the things that you enjoy. If you feel held back, we may be able to provide the support you require. Your body is designed to be healthy. When you're not feeling well, it's a sign that something in your body isn't working as it should be. We can help you discover your full potential for health, getting better from the inside out. We love seeing our patients not only be freed from discomfort but able to do everything they used to again and then so much more. Dr Irene O'Brien, Chiropractor Newstead, will help you reach your health goals with natural care. She is skilled in a variety of techniques to suit your needs. With a dedication to continuing education, she will use her years of knowledge to benefit you. After more than 25 years in practice, she is proud to have helped numerous people in our community. Contact Newstead Chiropractic today to learn more about what we do or to schedule your first appointment with us!